The key to sales growth is attracting more buyers to your brand—deepening penetration, getting more households in a particular market to buy. Worldpanel has validated this fact by looking at the correlation between sale changes and different consumer measures for more than 8,000 brands in 19 countries, including China. To attract buyers to your brand, start by gaining insight about consumer desires and behavior and launch related products. For example, in China today,brands would benefit from introducing premium products that fit with longterm trends that value health, quality,and me-time.In addition, brands looking to attractbuyers should be talking to a wide range of consumers as often as possible in various ways, including: creative media advertising and marketing; presence in physical stores with as many products on shelf as possible; and promotions to get better exposure in store and expand consumption (without discounting too heavily). But even for brands that do most things right, attracting buyers is never-ending task, as within any given year at least half of the consumers you won last year will leave and most of all your buyers will only buy one time. Globally, the biggest differentiator between a growing brand and a declining brand is distribution. This is also true in China. E-commerce has enabled many brands to reach audiences beyond key cities, but for most brands it does not replace the benefits derived from expanding presence in physical stores. Food and beverage is still overwhelming bought offline and has strong impulse element in brand and often category choice. China is a huge country with the fastest growth happening in the western and central regions, meaning many areas that might have been considered too difficult to reach or not profitable now offer potential to widen a brand’s shopper base. Brands constantly launch new variants in order to try and attract new shoppers. In practice, though, we do not see a strong correlation overall between the percent of sales gained from new products and whether the brand is growing or not. This makes sense when we dive deeper into the data. In China’s fast-moving consumer goods (FMCG) market over the last three years, 43 percent of the new SKUs launched from the top brands came from either a new pack size or pack type. Small changes to the current line-up do not result in significant incremental growth, as they do not offer anything new enough to enter into the consideration set of more buyers. The most reliable way to innovate and gain incremental sales is through offering a more premium product. This is especially true in the snacking and beauty categories, as shown when shoppers are willing to pay more for imported brands and betterquality ingredients. Dairy is also a category with a lot of incremental innovation as a result of trading up consumers through offering new products promising greater health benefits and exciting flavors. These include organic lines, such as ChangQing yogurt from Yili and Mengniu’s TLS yogurt, which operates at a price premium and won fans with its durian fruit flavor. 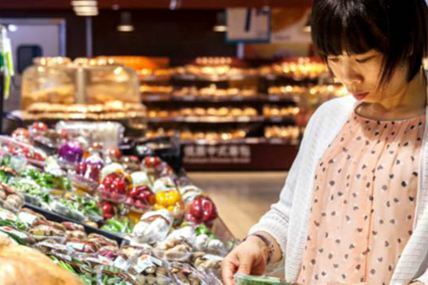 Chinese consumers are trading up their products across most categories in FMCG. In China, brands losing penetration tend to be 20 percent cheaper than average, showing that success is driven by tapping into the premiumization trend. Brands offering products that feed into wider macro trends in the Chinese middle class are more able to command a price premium. One mega trend is health and wellness, and it is expressed in the fast growth of organic and imported food, but also in related habits, such as gym membership and use of fitness apps. Another theme is the desire for small indulgences, where shoppers are looking for high qualtreats. Having more products on the shelf is a strong way of predicting whether a brand is growing or not. For example, 22 percent of the fastest growing brands in China increased their range size, while only 3 percent of the worst performing did. Although innovation of new flavors and pack sizes does not necessarily lead to brand growth, they can help if you are able to use these offerings to expand the space you have on the shelf. Growing brands are launching SKUs that are more attractive to retailers, to consumers,or to both. While sales share for these innovations are not any greater, these sales are incremental to the brand portfolio, rather than simply substitute sales in the existing range. Applying price discounts or providing extra volume does not lead to longterm brand growth; however, they are an unavoidable part of managing an FMCG brand. Everyone buys on promotion and 46 percent of all FMCG volume in China is sold on deal. The key to getting the best out of promotions is to seek to make them incremental to your brand and also the category. One way to do that is through larger packs and bundles, as these load up shoppers and have the effect of increasing their consumption rates. All categories have some expandability;however, big winners are snacks,ambient dairy, and soft drinks.One caution for designing your promotional plan: Avoid very large discounts (ideally those over 30 percent) as these can have negative impact on category sales value, and also can be detrimental for the retailer when going above 45 percent off the average price. Mental availability—awareness and consideration—still correlate well with brand growth. Increasingly,e-commerce is shortening the path-to-purchase, as the wealth of product information that can be accessed online enables consumers to go from being unaware to being ready to purchase, sometimes in a single sitting. This does not mean that old ways of advertising are obsolete, as many FMCG categories are still purchased offline. And while there is a higher chance of switching to more premium and imported brands, the larger offline players still have strong online sales share.